Allen “Woodrow” Smith fired a 2-hitter, his offence clicked and his defense eliminated the game one miscues as the Pirates evened the BVI Softball Association Juliette Penn Fast Pitch League Championships Series at 1-1, following Sunday night’s 12-0 flogging of Power Outage. Nickos Penn was the Pirates’ top hitter going 2-for-2 with a double, a homer, two runs scored and 3 RBI’s. Penn however, doesn’t see the Pirates winning the series and he thinks they’ll dethrone them. “That’s an easy thing to do,” he said. In the Women’s Division, after blowing our That’s Your Problem 25-8, the Hawks jumped to a 2-0 series lead following a 17-7 victory. 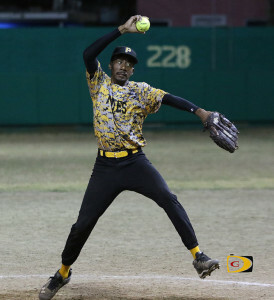 Sheniqua Fahie was the winning pitcher, while Chevaunne Richardson was tagged with the loss. Michelle Georges of Hawks went 3-for-4 with three runs scored. Annecha Graham had a 2-for-2 game with a home run, three runs scored and 4 runs batted in. Renee Hodge finished one for three with two runs batted in.